Not something I'm entirely happy about. I never wanted to be the button maker who showed up, made buttons, and (I thought) just quit. It's not that simple, anyways. I stuck around for almost a year! I also don't believe I'm done making buttons either. I just need a longer break than the one I had throughout the summer, to refresh my love for making buttons. But it's not fair to make people wait around for me during that time, which is why Belly Buttons is closed. What a great site I've created (no arrogance intended - I'm just proud!). I mean, just look at how much I've improved! I'd consider BB my first site. I get very attached to things like this, so it is hard to close. But I hope to become busier this year (job, teams, last year of high school), so this is for the best. There's so many people to thank, but I wouldn't remember them all, so I'll just let you know that, if I knew you visited my site, or if I ever got a neomail from you, you'd probably be included :) All those other visitors who came, thank you too! Good bye for now! I'll be back one day, but in the meantime, I'll still be running my other site, Kaleidoscopic. I couldn't bear to leave all the people I've met and talked to yet! Belly Buttons closed on September 22, 2011, with about 4700 hits! I really don't like the button I just made... dunno of it's just me or... If Flora doesn't like it, I'll happily (and gladly!) redo it! I misspelled another button. Let's hope I spelled it right the first time trying to remake it this time! I'm odd. I prefer making buttons on the weekday to the weekend, unlike many other button sites! Hopefully I have time for one more button later today! New affiliate, the amazing Kyuki! Therefore, I am now no longer seeking affiliates. Viky sent me the sweetest neomail! 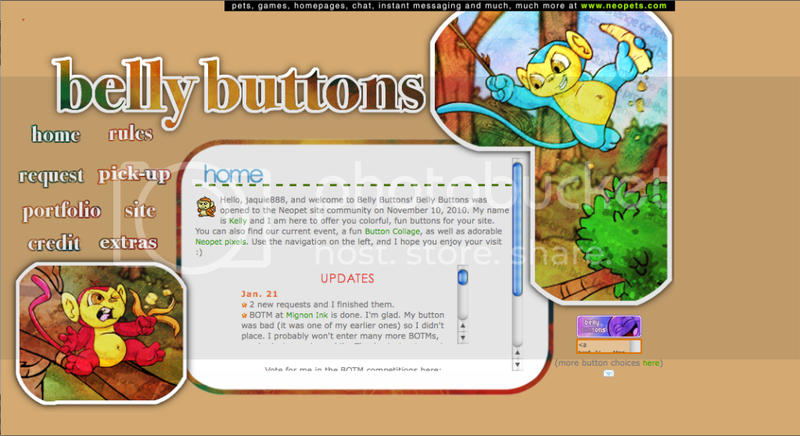 Thank you so much Viky, really makes me feel good 'bout my buttons :D Check out Impulse, Viky's site! Now affiliated with the cute pixel site, Vanilla Gazebo. New affiliate: Cass with her new site: Fantastic, a new premades page, Absolutely, as well as Bijou! Also, inactive affies (1+ months) were cleared. Be sure to reapply if you return! Here you can request a button! Please read the rules! After that, you just have to copy the entire textbox and then click the envelope below. From my userlookup, neomail me, make the message subject "Belly Buttons Request", paste the copied text into the message, and fill out the form. Please order only one button at a time. Remember to credit me with a text link or one of my link-back buttons. I can remake a button if you would like. Just be polite! Due to so many of my buttons not being used at new sites, your site must be 2 weeks old before I make your button. 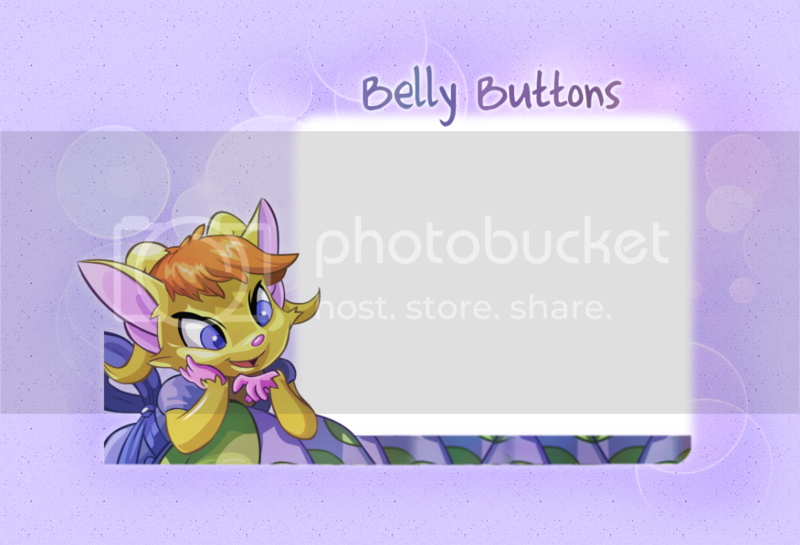 No buttons for off-site pages will be made, but I will make buttons for any sort of petpage (that follows Neopets rules). I will reply to your neomail once I have recieved your request to confirm to you that your request has been accepted. Add a link in the form that leads to the page you want the button to link to. I will decide your button border, animation, and font. If you would like to make a suggestion based on a button from my Portfolio I will take this into consideration. You can pick the image, though, or if you chose not to, I will. Name: Site URL: www.neopets.com/~ Neopets Image: Text: Any suggestions? Other: Thank you for your request! If you have any other preferences for your button or anything you would like to mention to me, be sure to include it in this part of the form. I will do my best to accommodate your request. If I have sent you a neomail that your button is complete, you will find it here! I will take your button down after it has been in the pick-up area for three or more days. If you did not get your button within that time, neomail me and I can put it back up here. This page contains the most recent of my buttons. Every once in a while, I'll move them to my full portfolio, which can now be found HERE. Newest on top, and they all link to the petpage site they were made for (unless, of course, it's not a petpage site!). Enjoy! I am now seeking a sister site. Neomail to apply! Please include a little bit extra, so I get to know you or your site a little. Want to join a competition with a TWIST? Visit my site, Kaleidoscopic for a different type of competition site! I made this site for you, guest. Visit it to find out more about Cellblock, get an unbeatable strategy, and win the trophy! Hover to see if I am recommended. Belly Buttons © jaquie888, November 2010. Layout skeleton by Vibe, edited by me, jaquie888. Acara PNG from Nienke's Resources. Button here signs from Foomanshu. Textures on layout and buttons are from 17 Day One, Swimchick, Foomanshu, and Nienke's Resources. Counter image from Dark Light. Bullets and envelopes from Cuddle Bug. Help with all sorts of little coding details thanks to Apartment Nine. The Neopet Credits below are from The Lodge. Button Portfolio' banner, Request status sign, and Back signs from The Lunch Box. Images from Neopets, Google, and DrSloth. I use GIMP to make my buttons. 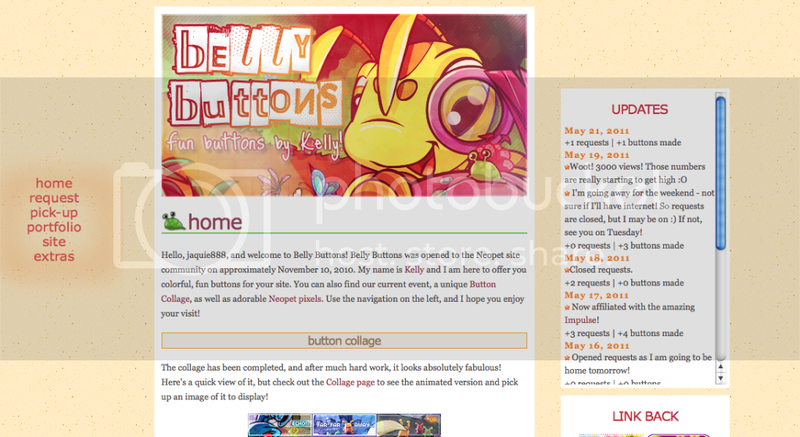 Welcome to Belly Buttons site extras! Here you can find many interesting tidbits. Now being hosted at my other site, Kaleidoscopic! Click on a button to visit the button maker's site! I just wanted to say, I've receieved so many positive comments about the Collage, as well as the idea being mentioned so many times at other sites. Your participation and help in getting the event out there is really rewarding :) I plan on running another Collage this summer, say June/July? See you there! Idea created: Jan 17/11 by me. I would actually love to see someone else host such an event, and I'd of course love to participate. If you would like to host a similar event, feel free, just be sure to credit me for the idea! I was inspired to start a button site when I first read Lucy's Button Tutorial. I made my first button using that tutorial for my guide, Unlock Cellblock. My first buttons, as you can see in my portfolio, were not so good, and sort of too in your face. Slowly, but surely, I've been improving, learning new techniques, gaining experience, and developing my style. When I first hosted the Button Collage Belly Buttons finally started to get recognized and noticed more. That event was not only so much fun to host, but I loved to see the positive results I got from other site owners. It was really gratifying. I'm not sure the exact date that I officially opened Belly Buttons. It was somewhere around November 10, 2010. When I was thinking of a name for my site, I wanted something that was unique, interesting, and also related to me. Almost the first thing I though of was Belly Buttons. My name is Kelly, so Belly Buttons was suiting, as 'belly' is a word I've heard almost too many times when people rhyme with my name! Not only that, but it would be obvious that Belly Buttons was a button site. Also, the reference to a belly button would keep the site name relatively humorous! Hope you enjoy not only my site, but the effort I've put into making it the best for you. Recognized at Soroptimist Directory's Site Recognition Month! Recognized by Chris as the "Up and Coming Buttonier" at Manifest! I really liked this layout. I made the background image, so I was really proud of that :D. I couldn't find a color I liked as a background, but the one in that picture is okay. I liked the Myncis though because they have belly buttons! Overall, I think it was cute and fun! I'm not so sure if I liked this layout. I liked the image, but I didn't like the shape of the layout I made, plus, as was noticed in a review with this layout, the updates box was incongruous. It just wasn't right, especially with the fun (rather than calm :P ) atmosphere I want to make with this site! This layout was actually inspired by a backround at Teetot that I fell in love with. I designed the layout around the backround, and although it did not turn out looking as great as I would've liked, I still really like it! When this image wasn't chosen for the Button Collage, I decided to use it for my layout! I thought it was cute, but just a little too busy. This layout was created by Add a Name Petpages, but I sadly lost it! Zel's layout was of course, beautiful!